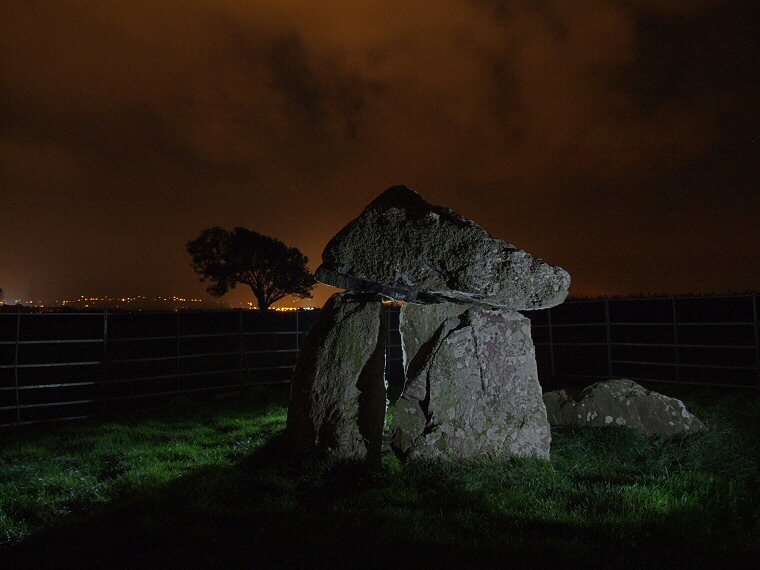 This pretty little dolmen in in fact the central burial chamber remains of a passage grave similar to some of those those found in parts of Ireland. 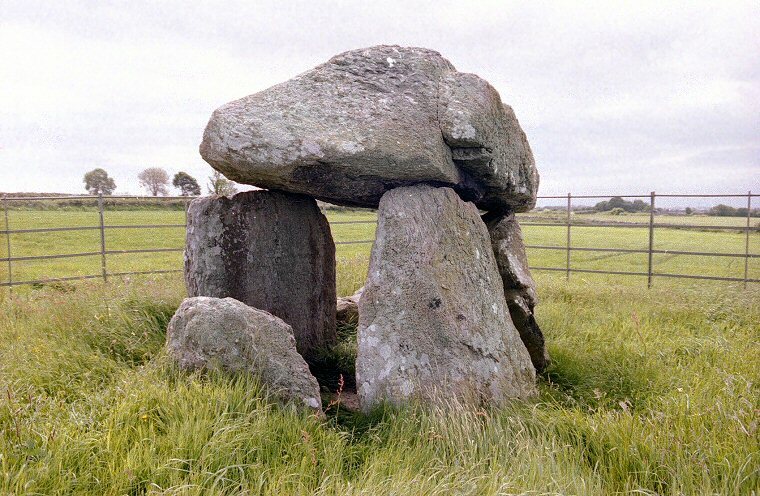 Three uprights around a metre in height support a wedge shaped pyramidal capstone about 2 metres in length and nearly a metre thick at its cap while a fallen stone nearby on the western side of the tomb could have been an upright or blocking stone, perhaps removed at some point in the past by those in search of treasure. Just beyond the entrance towards the southeast is a low boulder that may have been a kerb or sill stone. 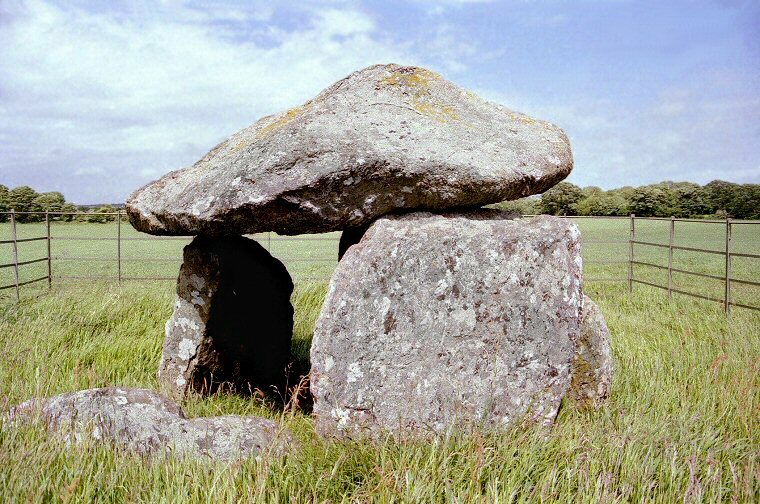 Originally the stones would have been set within an earthen or rubble mound with a narrow passage leading from the southeast to an entrance in the side of the mound, there is some debate as to whether the material around these types of tombs ever completely covered the stones or whether the top of the monuments was left open to the elements. 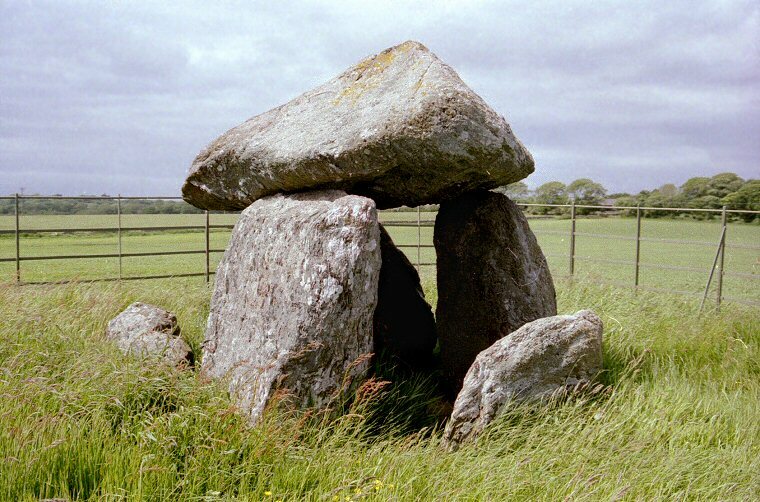 Whichever was the case at Bodowyr this lower part has been completely removed either due to erosion, ploughing or stone robbing leaving the monument looking somewhat marooned in the middle of a farmers field. 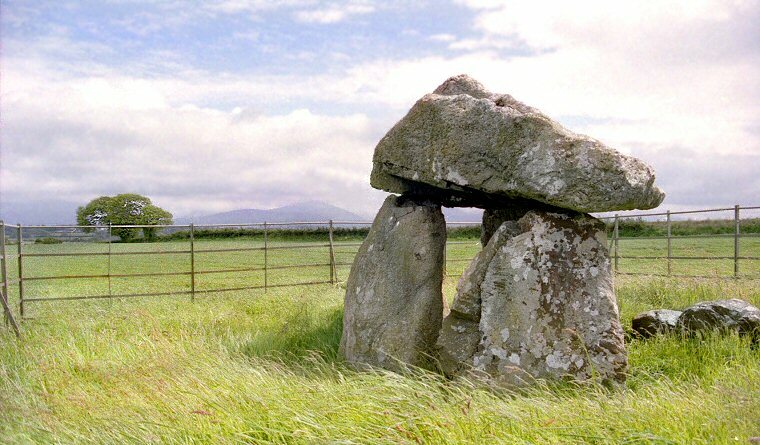 Bodowyr is set in the fairly flat low land to the southeast of Anglesey and most of the surrounding landscape while attractive is unremarkable however there are some fantastic views to the southeast across the Menai Strait around 2 miles away towards the hills of northwest Wales. Of particular interest is the gap in the hills between Glyder Fawr and Snowdon and this valley now known as the Pass of Llanberis may well line up with the entrance to the tomb and could point to a possible reason for the position and orientation of Bodowyr. Further investigation is needed to try to establish a solar or lunar alignment with these hills. Finding Bodowyr can be difficult and an OS map is highly recommended as it feels like the stones are in the middle of nowhere. Quite why then it needs to be 'protected' within an iron fence is not clear. Looking north at the entrance to the tomb, the sill stone is the low slab stone to the lower right. Looking west with the sill stone now to the lower left of picture. Bodowyr by night looking southeast towards the lights on the Welsh mainland.